Last weekend, Chef Paul Shufelt and the crew at Workshop Eatery played host to the 8th Annual Bacon Day Dinner. 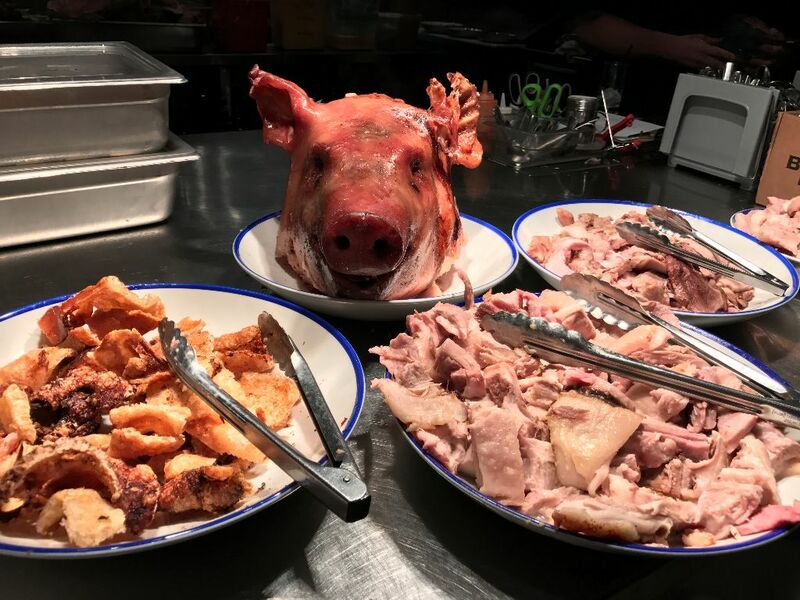 The event is designed to tempt diners to mass consume all things pork, but really it is about raising money for Youth Empowerment and Support Services (YESS). It is also a chance for Paul to cook with his buddies and former colleagues Chef Andrew Cowan and Chef Matt Phillips of Northern Chicken. Thanks to the generosity of many local sponsors including: Nicola and Alan Irvings of Irvings Farm Fresh who donate one of their Berkshire pigs and an assortment of cuts, Alberta Pork, Southgate Audi, and media sponsor CTV Edmonton, every penny from the $90 ticket price went directly to YESS. Along with a silent auction, live auction, a balloon draw, and the ticket prices – $25,000 was raised in support of YESS. More than 150 people came out to support the event, including some anti-meat eaters who protested for a few minutes before moving along. My official date for the evening was the lovely Liane Faulder, but thankfully she was ok with The Spaniard tagging along. My favourite dish year after year will always be the bacon truffle cream corn (check out the recipe). Over the years, Paul and his team has experimented with more house-made meats. This year, I was thoroughly impressed by the bounty of hand-cured and created charcuterie on display. Our friend Jose Miguel (another Spaniard in my life) was very impressed with the cured meat he tasted (Paul when a Spaniard who grew up eating jamon compliments you – you know you are doing something right). My own personal gluten free -Bacon Day sized portion – charcuterie plate. This year’s menu included a variety of tray passed appetizers as well as a taco station. I had no shame wandering into the kitchen and asking for gluten-free servings. The bacon jam on these sliders was awesome! Some Alberta pulses also showed up on the menu – pork and beans are the perfect pair. Our chefs for the evening took advantage of the fire outside, cooking up bacon-topped flatbreads and sausages from Spolumbo’s. The showpiece of the night when they wheeled in the Irvings Farm pig that had been slow roasting on a spit all day. Along with the help of Robin Wasicuna from Twin Pine Diner of Yellowknife, NWT, the crew had the hog from the spit to the plate in no time. The service staff, who all donated their time to the event, were incredible. At times I felt bad for them as they tried to run the gauntlet of diners with a tray of bacon cornbread baked oysters or bacon-topped smoked devilled eggs. The participant portion of the evening is always entertaining. Chef Paul and Chef Andrew have an annual dessert off and they do their best to sway voters in their direction. I’m impressed by their ability to come up with bacon infused sweet dishes year after year. This year, Paul was the fan favourite and he will proudly retain the trophy on the Workshop Eatery bar. While this gluten-free girl couldn’t indulge in Andrew’s bacon butter tart, I know his dessert was The Spaniard’s first choice (I managed to score a takeaway four pack which brought a shiny bacon-fat smile to his face). Congrats to Chef Paul Shufelt and the entire team that helped raise $25,000 and sent us all home with the meat sweats for the next two days. Mark your calendars! Next year’s Bacon Day has already been set for September 15, 2018.